← Pavelid Castaneda CD Release Party at CASBAH! 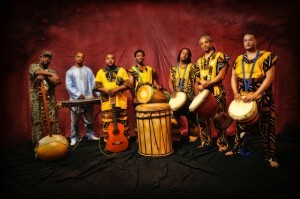 Africa Unplugged, led by Atiba Rorie, blends the best of traditional African music with everything that’s funky and NOW. They take the stage with all the purpose and power of Burning Spear and good times of a New Orleans brass band. Made possible in part by Friends of World Music. Where: CCB Plaza, 201 N. Corcoran St. Durham. Rain site: The Pinhook. This entry was posted in Artist, Event. Bookmark the permalink. Pavelid Castaneda CD Release Party at CASBAH!